Knee injuries in soccer are very common. Any sport, like soccer, that requires running at different speeds with sudden change of direction may lead to knee ligament injury sooner or later. When playing soccer, it is important to know the symptoms of a knee injury. Athletes recovery time will greatly depend on the severity of the knee injury. Players will need time to recover from the injury, and that time will depend on a few factors; including injury severity and proper rehabilitation before returning to the sport. Almost every soccer knee injury occurs due to overuse of the knee ligaments, through years of playing soccer or a different sport that requires sudden change of direction and speed. Knee stability is maintained by 4 ligaments. These ligaments are thick bands of tissue that stabilize the knee joint by keeping it in place and helping with the bending of the leg at the knee. In the picture above you can see the four ligaments (MCL, LCL, ACL, PCL), and Meniscus. MCL (Medial Collateral Ligament) is located on the inner side of the knee, while the LCL (Lateral Collateral Ligament) is located on the outer side of the knee. Both of the ligaments, MCL and LCL, prevent the knee from sliding sideways, keeping it in place with thick ligament bands on the inside and the outside of the knee. ACL (Anterior Cruciate Ligament) and PCL (Posterior Cruciate Ligament) are two knee ligaments located inside the knee, preventing the knee from sliding back and forth. ACL and PCL are two thick ligament bands that form an X on the inside of the knee. Meniscus are two shock-absorbing pieces of cartilage located between the femur and tibia. Meniscus knee cartilage prevents the bones (femur - top of the leg and tibia - bottom of the leg) from rubbing on each other. 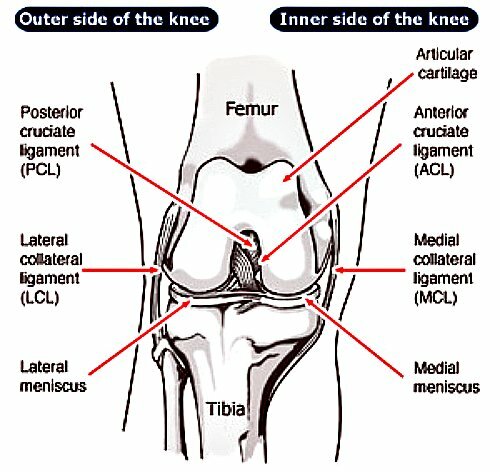 Knee ligament injury symptoms are very similar for all of the 4 ligament injuries. Inability to put any weight on the injured leg. There may also be a popping or snapping sensation at the time of the injury. In some cases, players around the injured player are able to hear the popping sound at the time one or more knee ligaments are injured. Knee injury is most common in sports that require lots of running at different speeds with sudden change of direction. Soccer, being exactly the type of sport where running at different speeds with constant change of direction is present throughout the game, is one of the sports where players have a fear of knee injuries. Knee injury can keep a soccer player on the sidelines for months, especially if the injury is not fully rehabilitated before returning to playing. Even the slightest knee injury should be taken seriously. When there is even a chance that the knee may be injured, players should immediately STOP playing. As the body cools down, pain and swelling may start to show. Not treating the injury right away and playing through the slight pain can have long term effects for months and in some cases years to come. The only way to fully diagnose any knee ligament injury is through visiting a professional and having an X-Ray or MRI of the knee taken. Once a knee injury does happen, it can have long term effects on the athlete, if not treated properly and right away. Most common treatment for soccer knee injury is the R.I.C.E method (Rest, Ice, Compress and Elevate). When the knee injury is more severe, it is best to take the proper time to heal, than to push yourself and play through the pain. Playing on an injured knee CAN, and in most cases WILL, lead to making the injury worse and bound to happen more frequently. Torn knee ligament injury will require a visit to the doctors office, where in most cases surgery is required to fix the torn ligament. With required surgery due to the severity of the knee injury, athlete will spend 6 - 12 months sidelined and rehabilitating the knee towards the long awaited return to sports and running. For more information on knee injuries in sports visit Different Knee Injuries and Symptoms.